Why growing businesses need to eliminate "one throat to choke" mentality. Smaller, growing businesses face unique challenges – including doing more with fewer employees. As businesses grow, it makes sense to have a company intranet to streamline communication, enable collaboration and manage day-to-day tasks. It's a powerful, yet easy-to-manage solution for improving employee productivity. What I've seen is that most small businesses initially leave the management of the intranet to one person. A gatekeeper, if you will. This person maintains the intranet, manages permissions, adds content and moderates communities. This centralized gatekeeper model works pretty well for intranet governance … for a while. Most growing businesses realize pretty quickly that this governance model creates a bit of a bottleneck. At some point, it's time to change the way they manage their intranet. It's time to bring more people into the mix to manage the growth of the intranet. This isn't as easy as it sounds, however. My team and I get a lot of questions from businesses about going from single-person intranet management to a decentralized, collaborative system. Why having "one throat to choke" may be choking intranet usage. Especially as your company grows, it can be tempting to assign the management of the intranet to a single person. In other words, have "one throat to choke." The benefits are pretty clear. You can rest assured that someone is managing the intranet and monitoring what goes on there. Consistency is guaranteed. Everyone knows who to go to for intranet issues. Unfortunately, this is often where intranets fail. First, putting all that responsibility on one person's shoulders restricts everyone else's usage. Your company intranet is a place for employees to share information, collaborate on projects and communicate with one another. Limiting intranet governance to one person will limit how much of that sharing, collaborating and communicating actually happens. Spreading the wealth of intranet management to each department or to a cross-departmental intranet team encourages intranet usage. That includes usage of all the productivity tools your company intranet provides, such as calendars, knowledgebases and communication tools. Second, centralized intranets can stifle creativity and innovation. When one person manages the whole thing, the result is a highly controlled and regulated intranet with a single person's vision at the helm of publishing and design. Granting others access to manage the intranet encourages creativity and innovation. Maybe every team site won't look identical, but you can be certain that it will reflect the character of the team – and inspire the team to use it more. Besides, if you have a clear brand identity and you've created brand guidelines, your employees will have parameters to create within. There's a time and a place for templated, one-size-fits-all intranet solutions – but as your company grows, you might consider more personalized solutions to inspire your employees. Third, if a single person is managing your entire intranet, you're setting yourself up for heartache when that person is on vacation, sick or – heaven forbid – if they quit. Decentralize your intranet management for increased productivity. Intranets are not the beasts they used to be. You no longer need an engineering degree to build a usable intranet. You no longer need a developer, designer, writer and webmaster to manage it. Also, years ago, the notion of letting everyone manage their own piece of the intranet resulted in … well … a big mess. Individual intranets were built for individual teams, and there was no sense of process or standards. Once again, modern intranet software comes to the rescue. It's now possible to have multiple intranet "sites" under a single portal. Today, decentralizing doesn't mean chaos. It doesn't mean multiple intranets, lack of standards, or incongruent processes. Decentralizing means empowering employees to use the intranet as a tool to help them with their day-to-day responsibilities. Of course, it's easy to say that, and a whole other thing to implement it. Right? There's a line that growing businesses walk between addressing the fact that individual teams (or even individual employees) want to "own" their part of the intranet, and an understanding that this means adding more tasks to employees' day-to-day responsibilities. The first thing you need to address when decentralizing your intranet governance is mentality. Your employees need to understand that the intranet is a tool to help them with their day-to-day responsibilities – not something that creates more work. When you dilute the responsibility among more people or departments, the intranet gets easier to manage – and more effective as a productivity tool. There are a lot of different governance models, but for small, growing businesses I highly recommend a collaborative approach. There are two ways of going about this. Create a dedicated team from across all departments to manage the intranet across the company. Allow each department to manage their area of the intranet on their own. With both of these models, multiple people from various functional areas are creating and updating intranet content. This spreads the responsibility of intranet management, sure – but it also spreads the responsibility of keeping other employees up-to-date. Communication blossoms and employee engagement grows. So how to you decide which model to use within your company? And how do you know which employees to pull into the intranet management team(s)? Those are two very important questions. But you also need to take into consideration that to improve intranet usage with your new collaborative governance approach, you might need to expand, redesign or add functionality to your existing intranet, too. Who is currently using the intranet? How are things currently done within those job functions or teams? What do those users need to do their jobs better? What motivates and demotivates your employees? What is the current culture of your company? Of each team? Determining your intranet decentralization and growth plan based on this insight will help make your intranet dramatically more valuable for your company. How to shift your team culture to a collaborative intranet management model. Like I mentioned above – the first step to decentralizing your intranet governance is addressing mentality. This also means shifting the culture in your workplace and tackling the issue of getting people to take ownership of their area of the intranet without creating more responsibilities. Here are five steps to do all that without losing your mind (or driving your employees crazy). 1. Create a steering committee or group. Identify a few key intranet stakeholders in your company (5-10 should do) and pull them together in a steering committee. Make sure at least one executive is involved, too, to act as project champion and bridge to leadership. Empower the committee to determine the direction, set the priorities, establish the go-forward team, and make the final decisions around shifting to a collaborative intranet governance model. 2. Set roles and permissions, establish clear guidelines, and provide training. Once the intranet management team is in place, it's time to create some structure around intranet usage. Not everyone needs (or should have) the same intranet user roles and permissions. The right to delete others' comments, for example, or publish content on certain pages, can be limited by creating user roles and setting permissions as appropriate. This is easy to do in Communifire, and can be changed on the fly. You can even set up profanity filters if you choose. Setting roles and permissions is only the first step to setting boundaries and expectations, however. The intranet management team should also come together and establish and document clear guidelines for usage. After all, you can't expect all your employees to know what's okay and what's not okay on the intranet if you don't tell them! Set clear guidelines and make sure those guidelines are communicated and placed in a centralized location (like the knowledgebase on your intranet) for reference. These guidelines don't need to be strict, but they should enlighten users about ways they can use the intranet, how to participate in discussions and contribute ideas, and what behavior is not okay. Bonus: Creating clear guidelines boosts employee confidence. Consider that your employees might be hesitant to add team-wide or company-wide content to the intranet. Creating a "best practices" document within your guidelines will reassure them that it's okay – and encouraged – to post appropriate content for the entire team or company. Finally, make sure everyone gets trained on how to use the intranet. Schedule training sessions where intranet managers give employees hands-on experience using the tools, and use that time to distribute your guidelines and let everyone know where to find the most up-to-date version online. 3. Encourage your team to use the intranet – and let go of control a little bit. This might be the scariest part for the new intranet management team. It's time to let employees fly from the nest ... and use the intranet. Depending on how much control your intranet management team retains, employees may administrate a lot of the intranet, or just a little. Either way, it's time to let go of control and let them explore the tools. There may be times where intranet managers need to step in to delete comments, fix incorrect content or consolidate duplicate pages, but believe it or not, most intranet communities are pretty good at managing themselves. Trust your employees to keep each other in check – but know that intranet administrators always have the power to delete content if things get out of hand. People might need extra encouragement if this is the first time they've been able to really get their hands dirty with the company intranet. A great way to get all the employees on board is to identify and reward power users. Have the intranet management team pay attention to who is posting most often and who is making valuable contributions to conversations. These are your "power users." Then grant those power users special privileges and/or intranet leadership roles. This will help employees feel more confident and motivated to use the intranet themselves. 4. Review intranet usage on a regular basis. Administering and moderating the intranet are only some of the responsibilities the members of your intranet management team have on their plates. It's all too easy for everyone to get sucked into their other day-to-day tasks and go days or weeks without seeing what their team members are doing on the intranet. Let's hope that doesn't happen often – but just in case, set up regular times for the intranet management team to review intranet usage. No matter how well-trained employees are, and how nice and cooperative they are, intranet managers will still need to provide constructive criticism now and then. It's just too easy to take conversations too far on the social intranet, accidentally post misinformation, etc. Just make sure the criticism is delivered as positively as possible to keep employees feeling good about using the company intranet. Remember, you're creating a culture of willing and happy intranet users – so do your best to keep them feeling confident. Intranets are great for so many things. But they're also FUN! Intranets help employees get to know each other better, give them a safe place to take a break from their jobs and chat with one another, and can even (if your guidelines allow) enable them to create communities around their personal interests. Don't let your intranet be all-work-no-play. Give employees the freedom to get creative and communicate about non-work subjects to improve employee engagement. A day in the life of a collaborative intranet. About.com is a great example of a company with a successful collaborative intranet governance system. You can read the full interview here, but I'd like to share some highlights with you so you can see how the advice in this article plays out in a real-world scenario. About.com initially created their ExpertHQ intranet site as an all-in-one solution for information sharing, discussion boards, blogs, newsletters and a ticketing system. ExpertHQ is used by About.com's staff and their vast team of writers they call "Experts." The staff set permissions for each community and space, and also established roles and permissions at the user level. After some initial miscommunications happened, the About.com team wrote up a clear "terms of service" document to make expectations clear for all community members. Today the company uses the intranet to communicate with its army of Experts, onboard new Experts and provide a place for Experts to talk to one another. They found that Experts often help one another troubleshoot problems, saving About.com staff from having to intervene. It's clear that even though Experts have limited permissions in the intranet, they are still using the tools to their advantage. ExpertHQ became an ideal solution for the staff and writers at About.com. Because governance and usage was determined from the beginning, it continues to run like clockwork as a one-stop-shop for communication. Growing small businesses are in the unique position of needing an intranet to streamline productivity and communication, but having limited resources. The right governance system is a key element in making an intranet solution work to its full potential. If you're ready to update your intranet governance practices or you're about to launch a new intranet solution to meet your growing company's needs, this free guide will really come in handy. 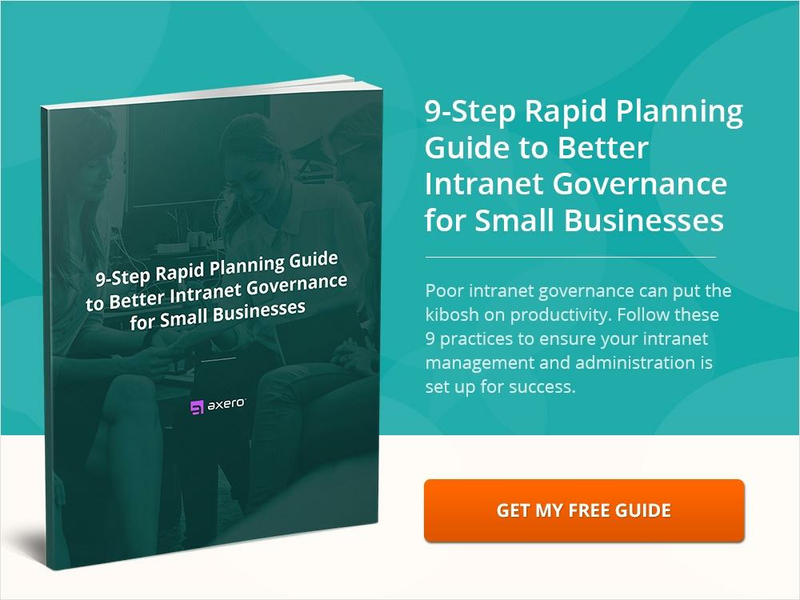 Download our 9-Step Rapid Planning Guide to Better Intranet Governance for Small Businesses and improve productivity and engagement right from the start.